If you are looking to play an awesome video slot game developed by Play’n Go casino software platform then you are at right place. The Legacy of Egypt is an online slot game powered and developed by Play’n Go casino software. This is one of the latest video slot games from Play’n Go. The game has everything for you. You will feel the pleasure of being in Egypt. The game is based and themed on ancient Egyptian culture. 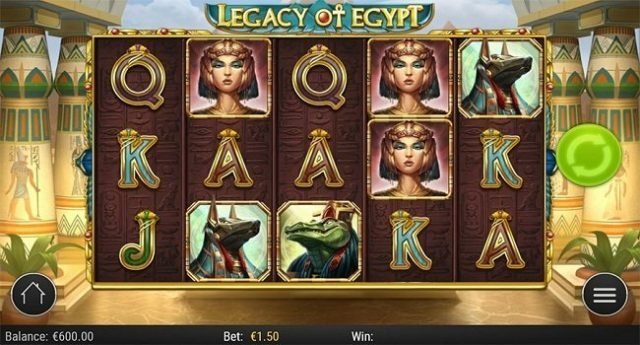 Legacy of Egypt is a 5 reels and 30 paylines slot game. This slot is playable at any of your devices like mobile, smart phones and tables for coin sizes of 30p per spin to up to £90 per spin. There are 2 bonus features available in this slot machine. The slot offers a jackpot of 5000 times on your total bet for and return of player percentage i.e. RTP for the game is 95.8%. Receive 3 to 30 free spins and up to 10x of multiplier while playing this slot with free spins. The game features powerful the Pyramid Spins feature which allows free spins. The game contains A, K, Q, J and 10 playing cards as symbols as well as various gods and leaders. Other important symbols of this slot machine are Sekhmet (who is the goddess of sun), Sobek (god of crocodiles), and Queen of the Nile also known as Cleopatra, Anubis (god of dead) and Pharaoh 9the most important person of the country). The most important person i.e. The Pharaoh is the highest paying symbol. It will offer you 10 times of your bet if you land 5 of the symbols across a payline. The game has wilds as well as scatter symbols. The scarab is the wild symbols which can replace all symbols except the scatter (i.e. Pyramid). The scatter will give you 16.66 times of your total bet, if you lucky enough to land 5 of these symbols across your payline or on screen. The scatter will also offer you up to 20 free spins. If you hit 3 or more of the pyramid symbols on your screen then you will trigger Wheel of Gods feature.